Plans for Friends of Music at Guilford's (FOMAG) March 28 concert at First Baptist Church began in 2008, when I was invited to Boston's Old South Church to hear a program of rarely performed liturgical chant by women composers. 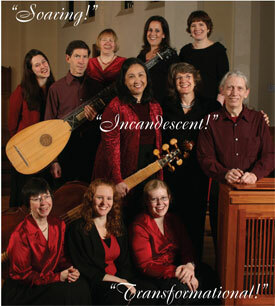 It was being presented by Cappella Clausura, a women's vocal ensemble dedicated to presenting "new" music, both sacred and secular, by women composers from the past 12 centuries. From the concert's opening measure, I could hear why Clausura had been making an impressive splash on the region's Early Music scene since its first concert in 2004. Since "deserving but infrequently performed music" has been Friends of Music's raison d'être for over four decades, I knew at that 2008 performance that I must champion the idea of FOMAG bringing Clausura to Brattleboro. And I was sure that March would be the right time of year to suggest featuring the group because this is when the Women's Film Festival and "Visions" Art Exhibit & Auction raise funds to support the area's Women's Crisis Center. In collaboration with these now long-established fundraisers, we are committed to adding the element of "Women in Music" to an annual celebration of Women in the Arts benefiting an important local women's cause. So here we are at last, looking forward to Clausura's arrival on Sunday, March 28. They will perform the rarely heard "Messa Paschale," an Easter season mass for four voices and continuo instruments by the brilliant composer Chiara Margarita Cozzolani (1602-1678), who spent her adult life as a cloistered Benedictine nun in Milan. The five-movement mass will be performed in its entirety with interwoven "propers" including sacred motets and chants by Cozzolani's esteemed colleagues from the medieval, baroque, renaissance, and modern eras, among them Hilary Tann's "Psalm 136" especially rewritten for high voices. Composer Tann will also present a short pre-concert program nearby on her life and work, which began in Wales and brought her to Union College in upstate New York via Japan, whose music has profoundly influenced her own. Click on these links for more details about the Women's Film Festival, "Visions" Art Exhibit & Auction, Friends of Music at Guilford, and Cappella Clausura ... and join us for some musical bliss!